Armed with my camera, intent on taking photos and doing a proper review for the blog, I headed off to Ferndale Nurseries in Constantia this afternoon. But first I stopped off at Biggie Best because they are having a sale and I saw some nice pots there a few weeks ago … I bought two great pots. I couldn’t believe the prices – I wanted to get one and ended up getting two, plus some other nick-nacks (yes, another candle holder!). The reason for the pot-buying mission is that I’ve been looking at lots of photos lately of beautiful gardens and I notice that often they put a grouping of pots with different plants in them within a flower bed … and I think it looks beautiful, so I want to try that somewhere in my garden. I see they mix different pot types together and it looks good. I’m not sure I can get it right, but I have to try. So with the two new pots in my car, I headed off to Ferndale and arrived at 3:40pm as they were closing the gates. They close at 3:50 on a Saturday apparantly (why not 3:30 or 4:00 – no, they close at 3:50). But the kind guy at the gate let me in, so I had all of ten minutes to grab a few things. So no “review” and no photographs of the nursery today. But I got my big sprayer (4 litres) which I will put to the test tomorrow. I also bought myself a few plants … I’ve been wanting a Clematis in my garden forever and bought a lovely one – it is Clematis “Nelly Moser”. (see pic).Also bought some pretty ground cover called Big Ben – hypoestes phyllostachya splash red – it’s got variegated leaves with red, I think it will add some interest at the back and it apparantly thrives in partial shade. Great for filling in some blank spaces I have at the back. 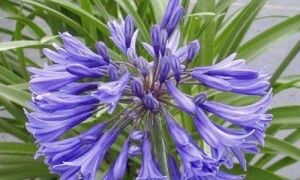 I also bought two small Agapanthus “new blue”. I don’t know why – I have plently of Agapanthus in my garden but those two called me and said “buy me, buy me”, so they came home with me. They are a lighter blue than the ones I have so they are a bit different. I think these might go into one of the new pots. 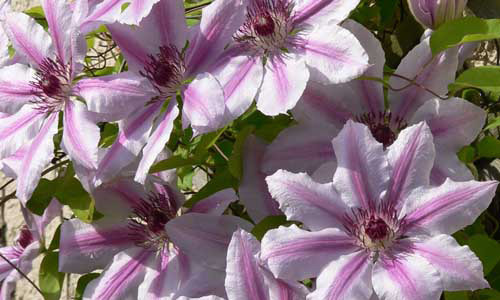 The Nelly Moser Clematis is a flowering vine that can reach as much as 12 feet in length, with off-shoots from the main vine reaching out 3-4 feet. Best displayed on a trellis, arbor, or other climbing fixture, the blooms start in late September and can continue all summer long. Nelly Moser offers a starburst shaped bloom 5-7 inches across with white ruffled edges and pink-colored pedals that grow in profusion. A midsized variety with leave forming a compact mound of 20-30cm. The flowers stand 40-60cm in height. The individual florets are much larger than most other agapanthus. This results in a very nice display of colour despite the individual heads having slightly fewer florets than some varieties. Tolerant of wide soil and water regime variations. Can be grown in full sun or light shade. I hope to get these all in the ground tomorrow. Hey – you have been busy! I also LOVE the plants-in-pots idea! You can make it very attractive with different type pots and different heights and different textures! Love to see what you do with your pots. If you eventually get bored with it or don’t like it, you can always move it around, or in a new place. That is the beauty of pots and planters. It is also a good idea to add a few herb pots inbetween to keep pests at bay. I will do some research on what to add to your pot garden. Oh yes, I love the Nelly Moser – very pretty! !